Scanning electron microscopy was performed on dialyzed complete chain (degummed silk fraction), soluble silk (light chain) and Insoluble silk (heavy chain). 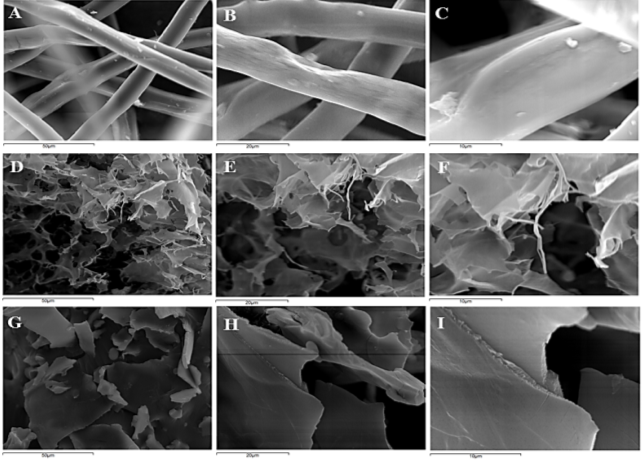 On SEM imaging of complete silk mesh network of silk fibers was observed, but, on separation of silk fibers no such fiber network is observed which shows complete separation of light and heavy chains. The white spots present in complete silk are traces of sericin. This is due to the stickiness of the protein material. For functionalization of silk surface by peptides carboxylic groups are required, however, in case of silkworm silk only 1.41% of amino residue contain carboxylic group which make it difficult to functionalize . For, increasing carboxylic functional group on silk surface diazonium coupling was done. In this coupling tyrosine and histidine present in silk fibroin was modified by diazonium salt having carboxylic functionality. This increase number of grafting sites by 6.7% . Figure 19. 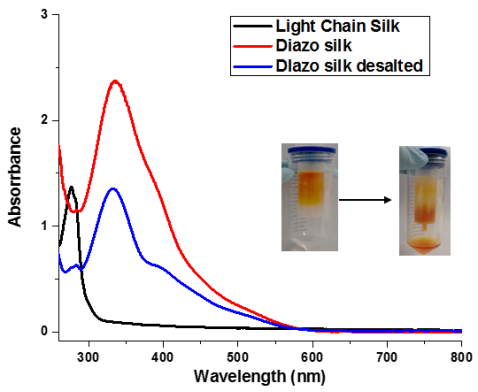 UV−vis spectra of light chain silk at different steps of Diazo-coupling. Inset shows Desaltation of Diazo-silk. 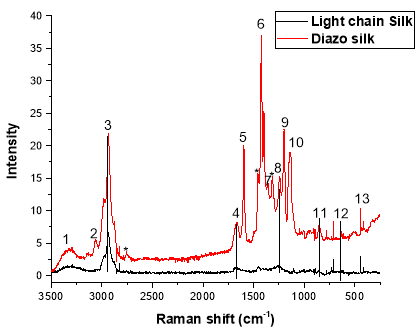 Diazotization of silk was followed by UV-vis spectrometer. In UV spectra of unmodified silk a peak at 280 nm was observed, which shows the presence of free tyrosine residue. When diazotization occurs this peaks disappear and a new peak was observed at 340 nm with a shoulder at 390 nm which correspond to azobenzene and its derivatives. The formation of azobenzene occurs by the reaction of phenolic chain of tyrosine with diazonium salt. On desaltation the absorbance value of peak is decreased due to removal of the unbounded diazo compound. Figure. 19 shows modification of tyrosine by diazonium compound. Figure 20. Modification of Tyrosine in silk by Diazo-coupling. 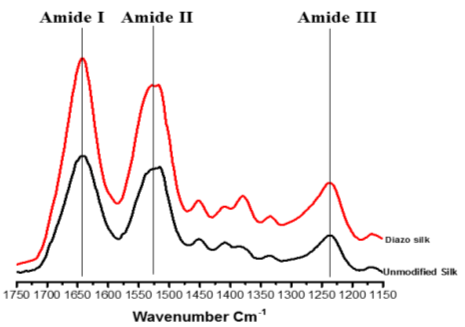 ATR-FTIR of unmodified and diazo modified silk (figure. 21) was done to confirm diazotization of silk. In both the spectra 3 major peaks were observed. A peak occurring at 1650 cm-1 corresponds to Amide I band of proteins . Board peak occurring at 1530 cm-1 depicts Amide II, which is resultant of bending vibrations of N-H and stretching vibration of C-N . This peak also corresponds to β-sheet structure of protein. Another peak was observed at 1240 cm-1 this corresponds to an Amide III band. These bands, mainly arise due to a mixture of coordinate displacement . So these results show that there is no change structure of protein in silk after surface modification of diazo salts. In this study no peaks were observed from the diazonium compound because entire spectra was dominated by the protein backbone of silk . All the peptide was synthesized by SSPS method. All these peptides are selected on the basis of their charge at different pH value and binding affinity for HAP system (figure 23). Mass spectroscopy and HPLC were done to determine purity of these peptides. HPLC of CAP(S), Si-4 and Cap (A) peptide shows purity of 90.82%, 80.90% and 96.78% respectively. However, In Case of Cap (H) HPLC no peaks were obtained this because this peptide doesn’t dissolve in the solvent. 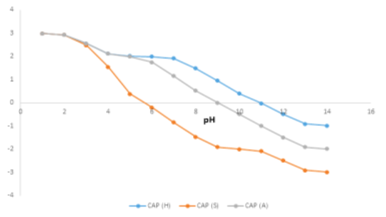 Cap (H) is 50% hydrophilic and 50% hydrophobic. Different solvent were used for dissolving this peptide but no results were obtained in HPLC until now. Figure. 23 Graph Showing Charge on the peptide at different pH value. Mass spec of all the peptides matches well with the monoisotopic mass of peptides. XRD of synthesized samples was done to obtain characteristic peak of hydroxyapatite. To determine the phase of calcium phosphate formed in the synthesis. FTIR of all the samples was performed to determine the formation of Hydroxyapatite (HAP). A standard sample was also run for comparison of results. 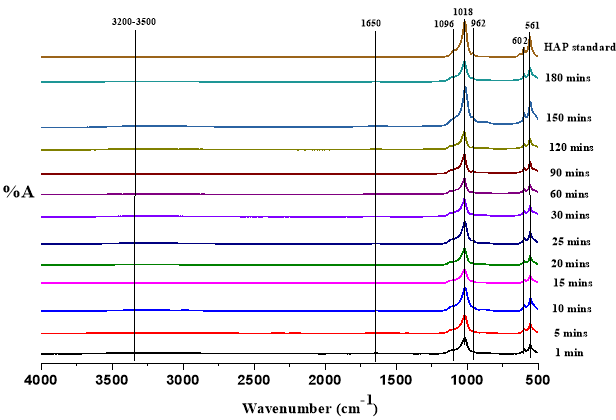 All samples show the same IR spectrum confirming the formation of HAP. A peak corresponding to hydroxyl stretching was observed from 3200-3500 cm-1 (for clear IR spectra check appendices of chapter 4). Another peak corresponding to hydroxyl group was observed at 1650 cm-1 these two –OH peaks confirm the formation of (HAP). A shoulder peak occurring at 1096 cm-1 corresponds to PO43-. This peak occurs due to v3 bending mode. Peak at 1018 cm-1 corresponds to HPO4 2- present in non-stoichiometric HAP. The Peak occurring at 962 cm-1 depicts non-degenerated symmetric stretching of the P-O bond. Two peaks observed at 602 cm-1 and 561 cm-1 occurs due to triply degenerated bending mode of O-P-O bonds. All these samples match well with standard sample. Thus confirming the formation of HAP. Figure. 25 ATR-FTIR of all HAP samples prepared at different interval of time. All prepared samples were carbon-coated on aluminium stage. SEM-EDX characterization was done to determine Ca:P ratio in synthesized samples. A standard sample was also setup for comparison of results. Each sample is characterized at five different magnifications and EDX was done on each magnification with elemental mapping. Ca:P ratio on each magnification for all the samples is given below in Table 4. Figure. 26 (I-III) shows SEM images with elemental mapping for all the samples at 5000x. All these results show that formed sample is calcium deficient-HAP i.e. Ca10x (HPO4)x(PO4)6-x(OH)2-x (0 < x < 1) CDHAP has value between 1.5 to 1.67 .